For ideas in your weekly meal plan, I’m listing some of the things on sale at your grocery stores, and then following that with recipes from my Recipe Box that coordinate with those sales. Let me know if you like this and if it helps you out with your weekly meal planning. 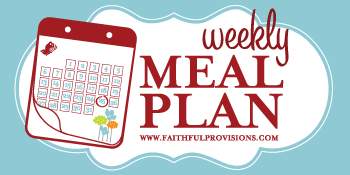 *If you think the weekly meal plan is something your friends could use, please share it on Facebook using the button above! Last week I got pretty well stocked with produce (spinach, apples, pears, bananas), milk and bread, so we are pretty set. I”ll probably make a quick trip to grab any great stock ahead deals and replenish any produce needs we might have. I’ll serve this with some leftover shredded beef brisket I have in the freezer and serve it with corn tortillas. I will use the Homemade Chicken Stock and leftover chicken from Crock Pot Roasted Chicken, adding whole wheat wide (egg type) noodles with carrots and celery. *We purchased a 1/4 cow last year and have tons left, organic spinach from Costco and veggies in fridge, topped with a dressing. *Use leftover Black Beans from crock pot on Tuesday and top with freezer veggies. *We have started attending out Saturday night church service and we use our local coupon book to get a half price dinner out! *Click on the links below to go directly to recipes for each item! **It’s National Oatmeal Month, so you’ll find oatmeal products on sale everywhere, too. 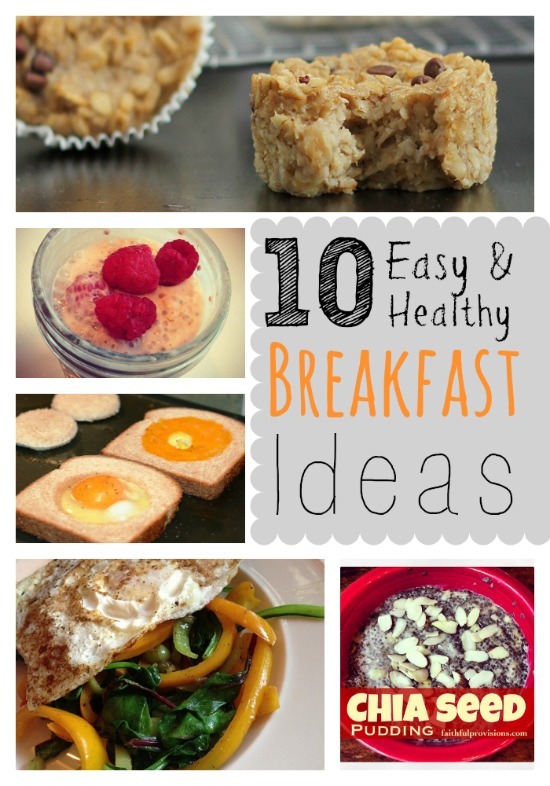 Be sure to check out all my Recipes for Oatmeal HERE. 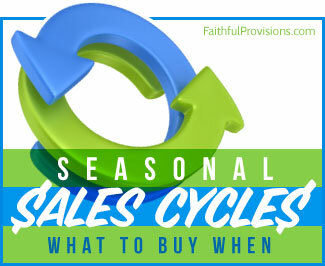 Find out What to Buy When in January, and stock up on food items at their lowest prices! Kroger is featuring a Game Day Greats Mega Event for you this week to help you save for your super bowl party. You’ll like the Hormel Sliced Pepperoni or Salami, 3.5 oz ($1.00), Perdue Split Chicken Breasts, Drumsticks or Thighs ($.99/lb), and Kroger Ground Chuck ($2.79/lb) in the meat department. There are also tons of great deals in the produce area: Kroger Yellow Onions, 3 lb bag ($1.79), Hass Avocados ($1.00), and Bananas ($.38/lb). Buy extra bananas to flash freeze and add to smoothies! Kroger cheese in on sale too. STOCK UP on these items, and be sure to check out our Kroger coupon matchups so you can save even more (price listed is after coupons): Hunt’s Tomatoes or Paste ($0.39), Kraft Salad Dressing, 16 oz ($1.42), Post Cereal, select varieties ($.99), and Hormel Chili or Chili Master ($.72). Eating organic on a budget? This week, you can save on Mom’s Best Naturals Cereal ($.49), Horizon Organic Milk, 3pk/8 oz ($1.94), and Organic Salad Mix ($2.99). :: See all the Kroger Deals HERE. In the meat department, the Cumberland Gap Semi-Boneless Ham ($1.89/lb) will be great for sandwiches, and the Ground Chuck ($2.79/lb) is perfect for Texas Chili. STOCK UP on these BOGO items, and be sure to check out our Publix coupon matchups so you can save even more (price listed is after coupons): Quaker Oat Hearts cereal ($.64), selected varieties of Kellogg’s cereal ($1.51), Pompeian Imported Olive Oil, 16 oz ($1.99), and I Can’t Believe It’s Not Butter! Spread, 8 to 10 oz, 16 oz box, or 7.5 oz 2 pk ($.23). :: See all the Publix Deals HERE. Poppy Seed Ham Rolls Make ahead and freeze for your Super Bowl Party. I love the weekly meal plans Kelly!! Thank you so much!